This was Pawnee Country, the last Nebraska home of an Indian Confederacy which once numbered more than 10,000, consisting of four tribes -- Skidi, Grand, Republican and Tapage. Their domain covered a large part of Central Nebraska where they lived in permanent earthlodge villages and developed an elaborate religious and social organization. The Pawnee grew corn, made pottery and many flint tools and weapons. They depended on buffalo for their meat and hides, and each year carried on extended hunts along the Platte and Republican rivers where they conflicted with their enemies the Sioux and other Plains Indians. In 1857 they ceded their remaining lands, with the exception of what is now Nance County and established their villages at this site under their famous Chief, Petalesharo. Nearly always friendly to the Whites, the Pawnee furnished scouts commanded by Major Frank North, which were a colorful and effective fighting force in the Indian wars of 1864-1877. Under continued harassment by nomadic tribes and demoralized by association with the Whites, the Pawnee dwindled in numbers and prestige. In 1873 they suffered major losses in battle with the Sioux at Massacre Canyon near present day Trenton. In 1874-1875 they left their ancestral Nebraska home for a reservation in Oklahoma. 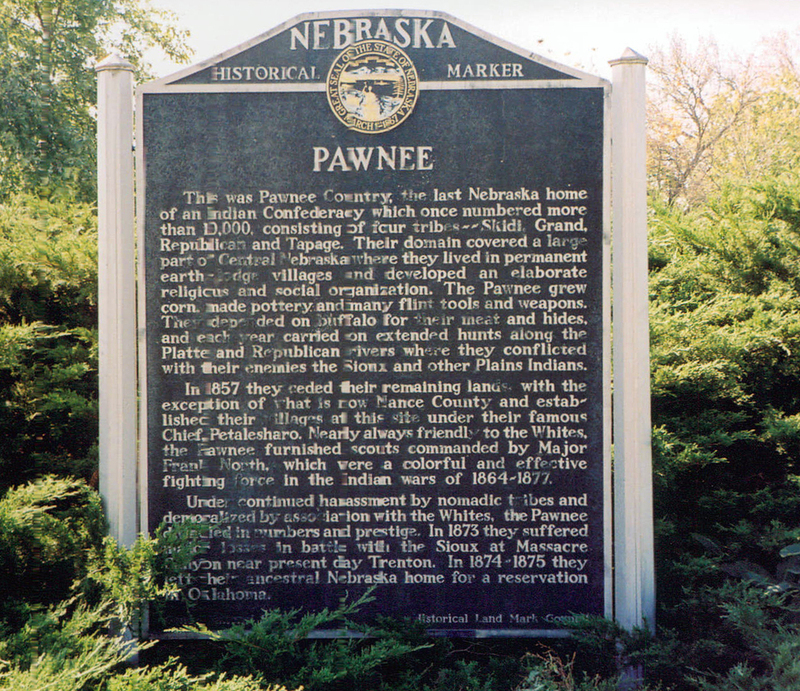 “Pawnee,” Explore Nebraska History, accessed April 19, 2019, https://mynehistory.com/items/show/367.